Empire of the Sun, the product of a side project, has far outlived its life expectancy, and is the perfect testament to the power of exposure in today’s music industry. 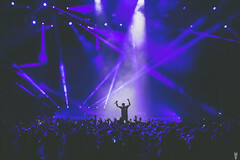 The electropop duo is comprised of Luke Steele of the alternative rock band The Sleepy Jackson, and Nick Littlemore of the EDM group Pnau, both well-established and highly regarded Australian groups. The influences of their respective musical preferences would prove to be the perfect combination to create Empire of the Sun’s signature sound. Their debut album, Walking on a Dream, quickly turned into a worldwide sensation. 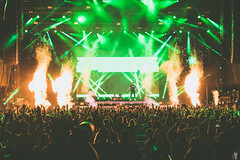 After charting in nearly a dozen countries, turning gold three times and platinum once, the album immediately catapulted them to the forefront on electronic music circles. Despite this rapid success, Empire of the Sun seemed to continue to behave as a side project, which we can’t forget that they were. Following the album’s release, the group didn’t tour often, and most of their live shows were festival appearances, albeit among the most prestigious lineup positions and stages that they had ever played individually. Five years would go by until their sophomore album, Ice on the Dune, would be released. Piggybacking off of their previous success, this album was perceived in almost identical ways, charting in the same countries and seeing its single, “Alive” become one of their most popular anthems to date. Again, however, Empire of the Sun remained in the shadows and only randomly made festival appearances, many of which weren’t in the US. That would all change shortly after thanks to a Honda Civic commercial featuring Empire of the Sun’s earliest single, “Walking On A Dream”. 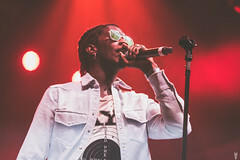 The massive exposure the commercial generated, especially after airing during the NFL playoffs, allowed the song to land on Billboard’s Hot 100 chart in the US for the first time ever. Eight years after their debut, and in the most unpredictable way, Empire of the Sun had finally cracked America. The duo found inspiration in their new success and rode that high all the way through to the release of Two Vines, their third studio album; one that maybe never would have been produced had it not been for the Honda commercial. In a nutshell, it’s good, easy to listen to, and its songs could be interchanged with any on their previous two albums. The latter is also its biggest criticism. For those of us who like to see transformation throughout a band’s discography, we get little of that with Two Vines, and certainly nothing that would bring new fans to Empire of the Sun. Perhaps the most unique song that exhibits any of those characteristics is “To Her Door”, in which Fleetwood Mac’s Lindsey Buckingham makes an appearance on guitar. Co-produced by Peter Mayes, who’s worked with Sia and The Killers, and recorded in Hawaii, the overall vibe of the album is far more mellow and dialed down than any of their previous work. Its two singles, “High and Low” and “Two Vines” are softer versions of the duo’s other infectious dance hits like “Alive” and “We Are The People”. In a press release, Littlemore described the album as an “image of a modern city overtaken by jungle, almost like mother nature taking back the planet.” Their lofty goals of transporting listeners back to a time in which plants ruled the world in harmonious fashion don’t quite transpire. The album lacks depth when it comes to an overall message, especially lyrically. However, for a band who has been around for a decade, hasn’t toured much (or ever really), and who have only 3 albums to their name, Two Vines is another great representation of the sound Empire of the Sun has become widely known for. Unlike the imaginative New York City that gets taken over by plants, Empire of the Sun should continue to stand tall among the electropop groups that have come and gone during their existence.